Is your dog a "Free Spirit"? Does he need some help with his behavior? 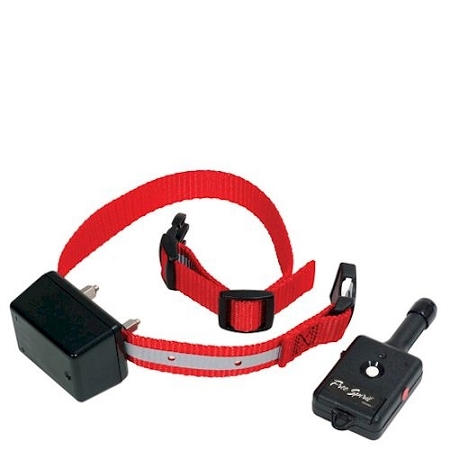 The Innotek Free Spirit Remote Dog Collar for Training is ideal for convenient training around your home or neighborhood and this remote training collar fits easily in the palm of your hand. Having a better behaved dog has never been quicker or easier. You can spend more time playing and less time training. With a 150 Yard Range, the Innotek Free Spirit Dog Training Collar has just the right touch, just when you need it. The Innotek Free Spirit Shock Collar features a convenient switch to instantly increase the correction strength by two levels. The water-resistant receiver uses a 6-volt battery (included), so it is always ready to go. The Innotek Free Spirit Remote Trainer offers 7 levels of correction to match your dogs' temperament, and a 150 yard effective range. You simply program the receiver to your choice of correction levels, and press a single button to activate the training collar. A handy slider switch on the side of the transmitter increases the correction level by 2 in emergency situations. You may program the unit to sound a warning tone if you prefer. Innotek offers FREE Professional Training Support. Innotek Shock Collars are designed by professionals to be the fastest way to a better-behaved dog and supported by professionals too! Call the Free Training hotline and they will gladly walk you through your training challenge. Call as often as you wish, the help is always free.